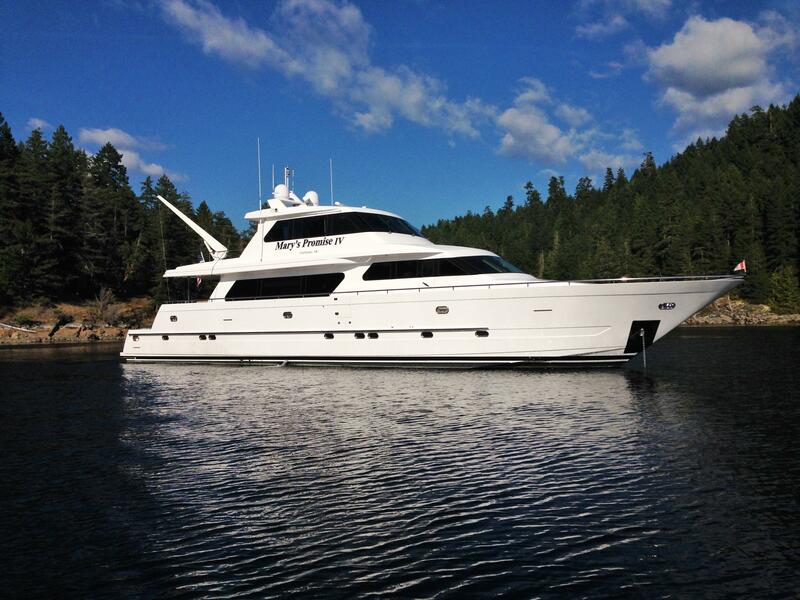 The owners of this Beautiful Boathouse kept - Captain maintained Motor Yacht are motivated to get it sold! 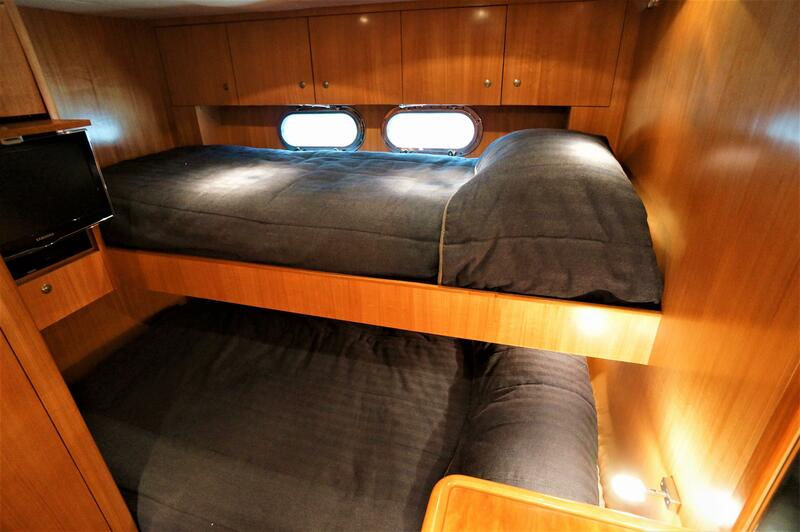 A 105' boathouse at Twin Bridges Marina is also available. This luxury vessel's sophisticated European inspired exterior, sumptuous interior, smartly designed crew area, with its chef’s dream galley and Horizon’s notable sea-keeping capabilities, every detail has been designed to exceed the owner’s expectations. 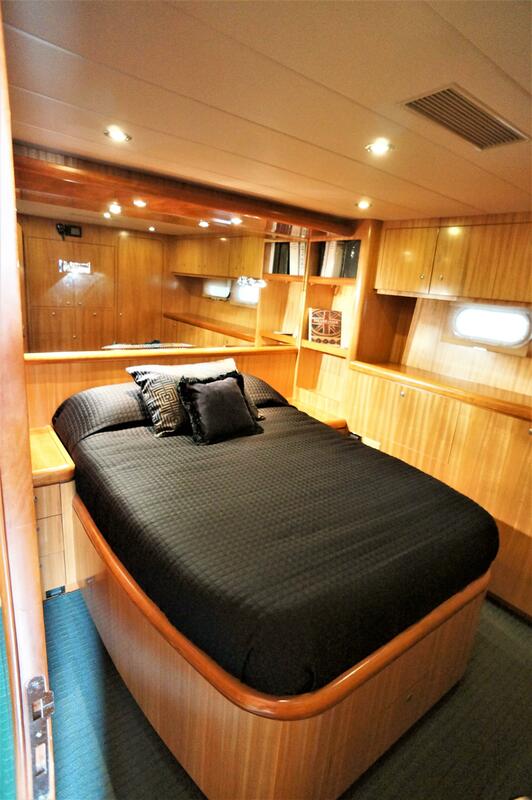 Offering five beautiful owner’s, guests and crew staterooms with five heads, all finished in a handcrafted satin cherry, with an extraordinarily spacious skylounge, formal dining, Adventure toy storage and a spacious, well deigned engine room. 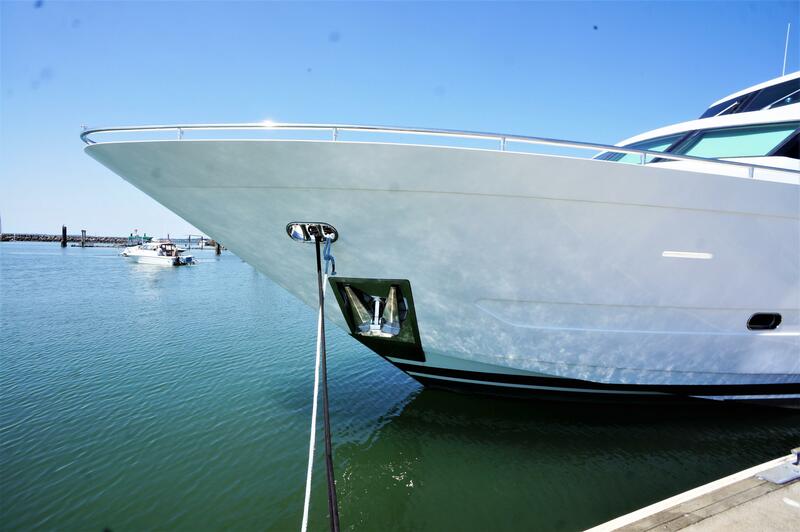 This beautiful yacht been cared for and maintained by its current owners for 10 years. Elegant, sophisticated and understated is the way to describe "Mary's Promise IV". 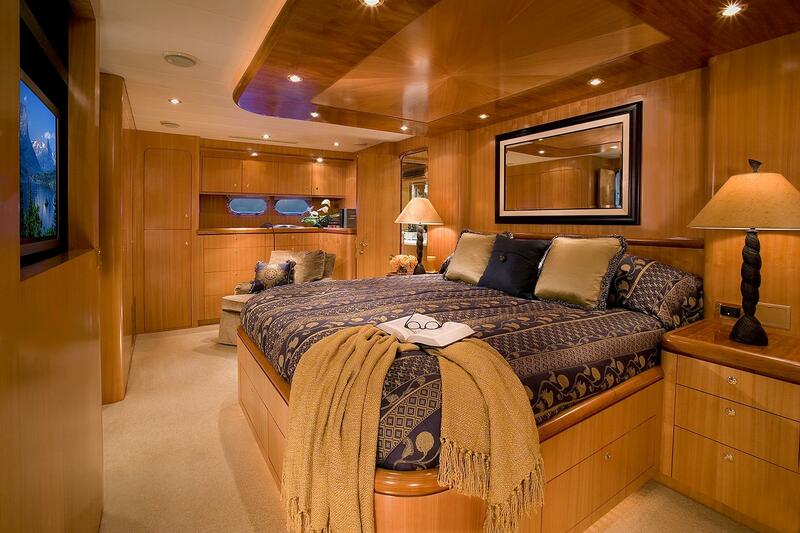 The yacht as with all large Horizon Motor Yachts offers a beautiful interior of handcrafted cherry woodwork, combined with smartly chosen soft goods, stainless steel, Italian light fixtures and other materials to create a warm, sumptuous and comfortable living space. 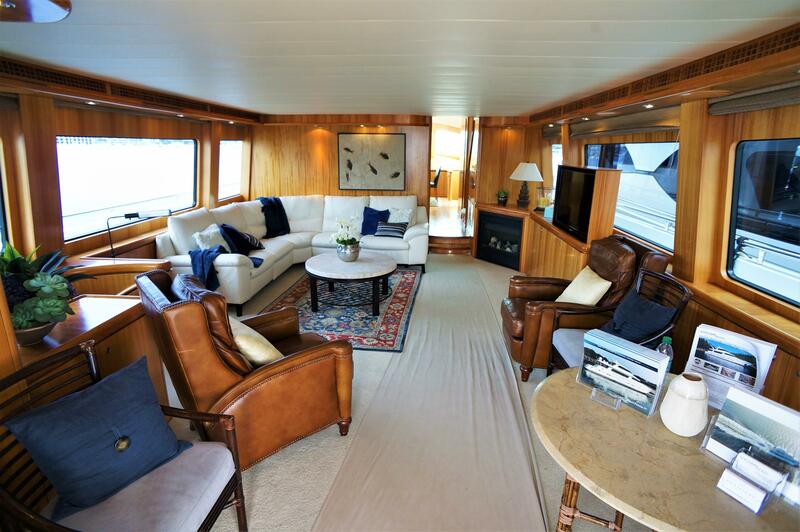 Living spaces include a 21'6" long main salon, a California deck that seats 12, large fore deck perfect for sun lounging , and a upper salon located in the skylounge. Each space offers smarty designed furniture layouts & storage as well as making each area feel large, but cozy at the same time. 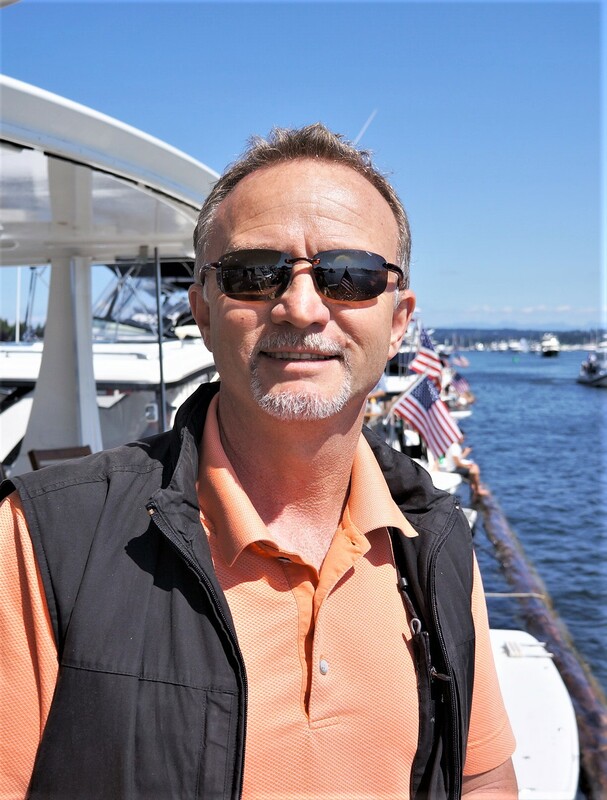 This is a yacht that you can feel at home aboard and with all the living space, you will have room for your family and friends to join you for extended voyages. Main Salon: An open, warm and thoughtfully designed space. 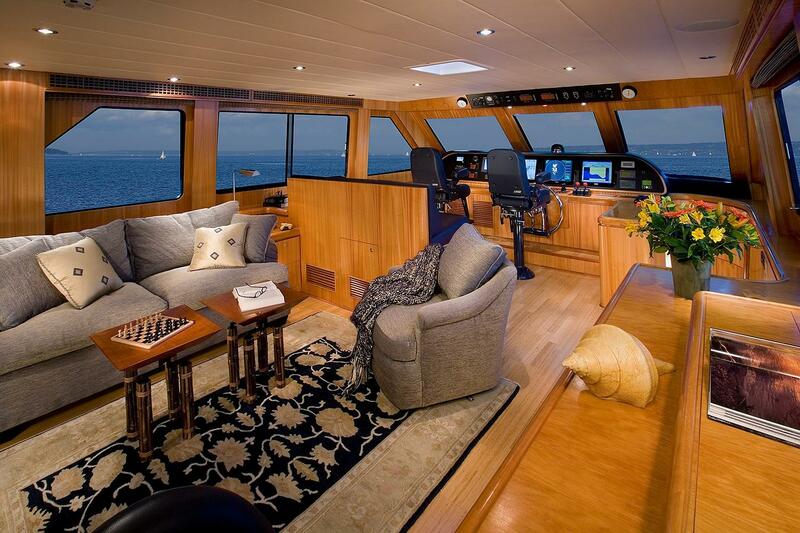 A large entry door from the California deck brings you into a living, gaming, restful space that was smartly designed and offers exceptional visibility out the aft or side windows from any of the sofas or chairs in the room. 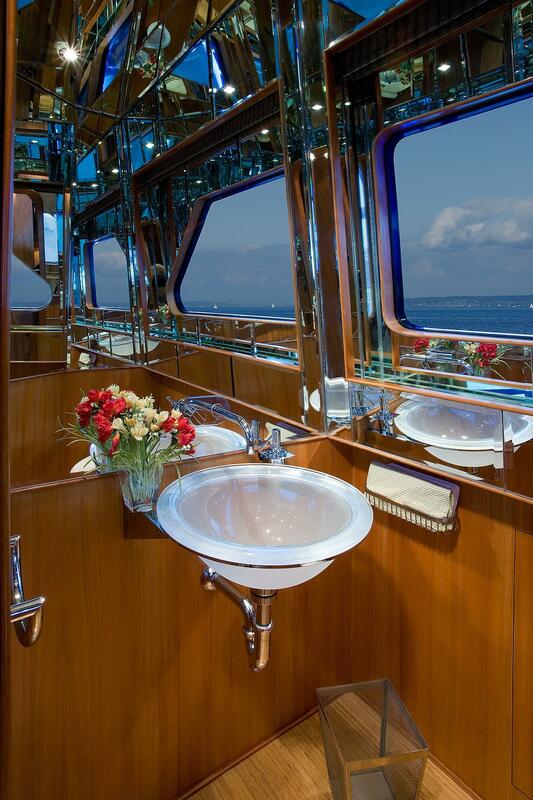 There is a beautiful-modern day head located in the forward starboard side of the main salon. Main deck day head: This head is a stunning example of simplicity & creativity. The head offers a stainless sink base mounted on the forward wall with a round glass vessel nestled on the top and a chrome fixture extending from the wall. The clever use of bamboo flooring, LED lighting and mirrors create a beautiful light space. Galley & Formal dining: The galley and formal dining rooms are located forward of the main salon. 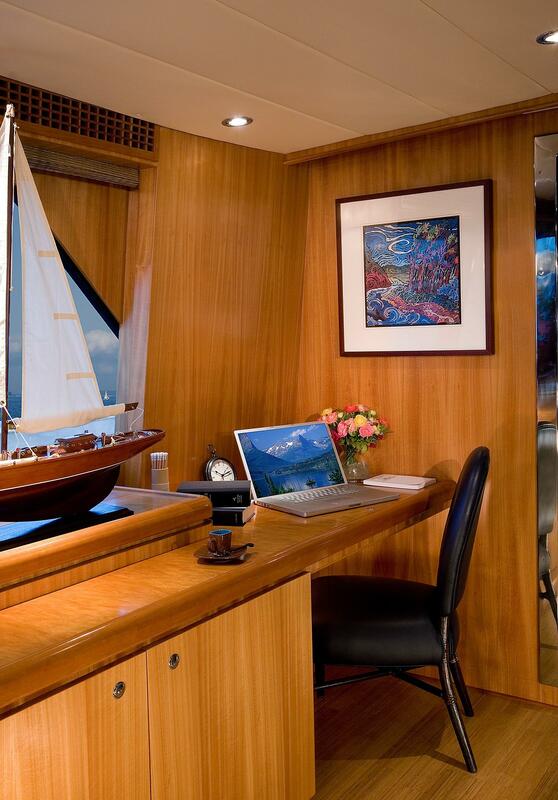 Suites & staterooms: Five Suites & staterooms with five heads. 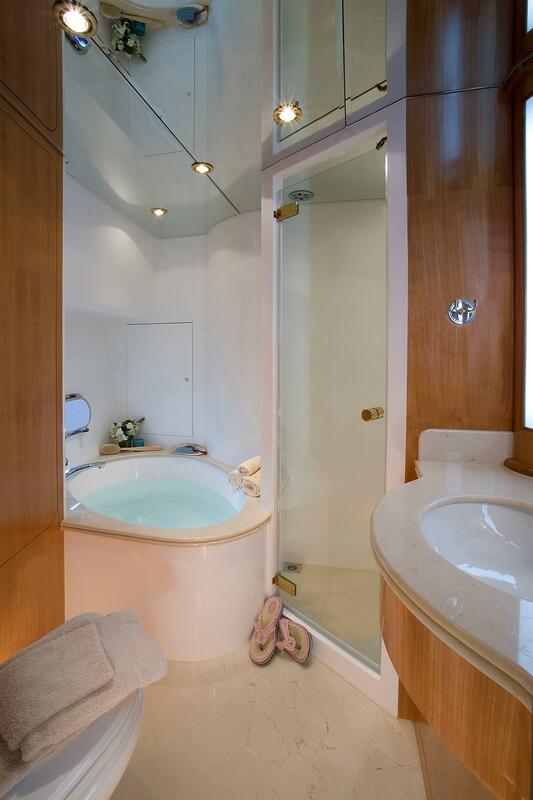 There are three staterooms and a laundry room located forward of the main salon, each stateroom features an ensuite head. 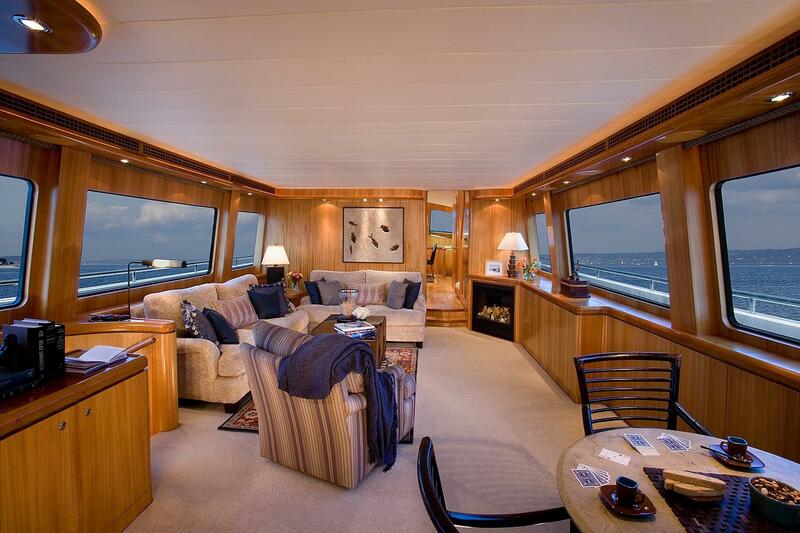 There are two staterooms and one head located aft, and are accessed through the main salon. Owners suite: The owners suite offers a island king bed, abundant drawer and cabinet storage, large walk-in clothes locker, a Marcos of New York reclining chair and a smartly designed ensuite head. 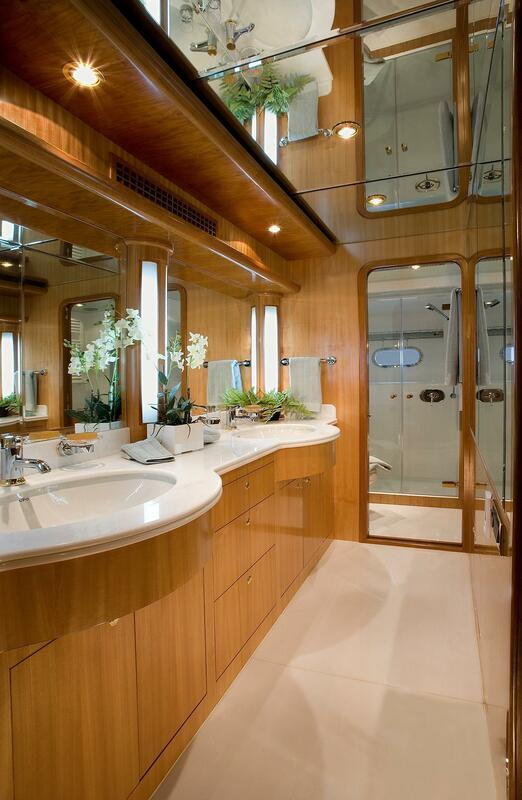 A smartly designed and executed "full-width" head situated behind the master berth, a creative design of Cherry wood, marble, S/S & chrome, LED lighting and mirrors that resulted in a warm and inviting master bath. Features include heated marble flooring, marble countertops with his-n-hers sinks, heated towel racks, dressing mirror, a separate water closet for the toilet and large stall shower. Forward VIP suite: "5-Star" is the best description of this sumptuous guest suite. It's very spacious, offers abundant natural light, a beautiful queen pedestal bed and a phenomenal ensuite head, this is truly a guests dream suite. This bath offers a large soaking tub and stall shower, marble floors, large storage locker and a cherry wood vanity with under-counter HCG sink with marble countertop. The combination of natural and Led lighting create a soft cozy feel. Guest stateroom: The guest stateroom offers side-by-side single beds that have an insert that fits between them, so if desired the twins can be converted into a king size bed. 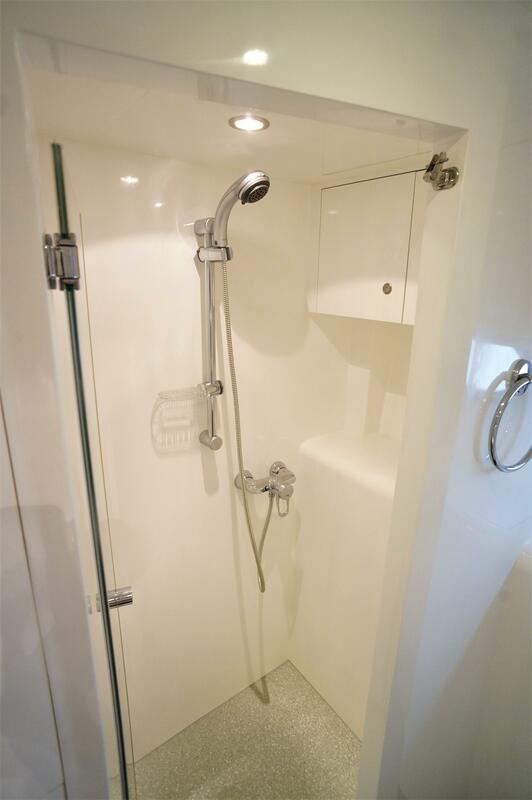 The room is bright open and has an ensuite head with stall shower. Laundry/Utility room: The laundry room is located off the foyer just in front of the owners suite. It it is a bright space finished in white cabinetry with bamboo floors. Features include full-size Whirlpool washer and dryer, sink with hot/cold water, ironing board, portlight with screen and abundant cabinet and drawer storage. 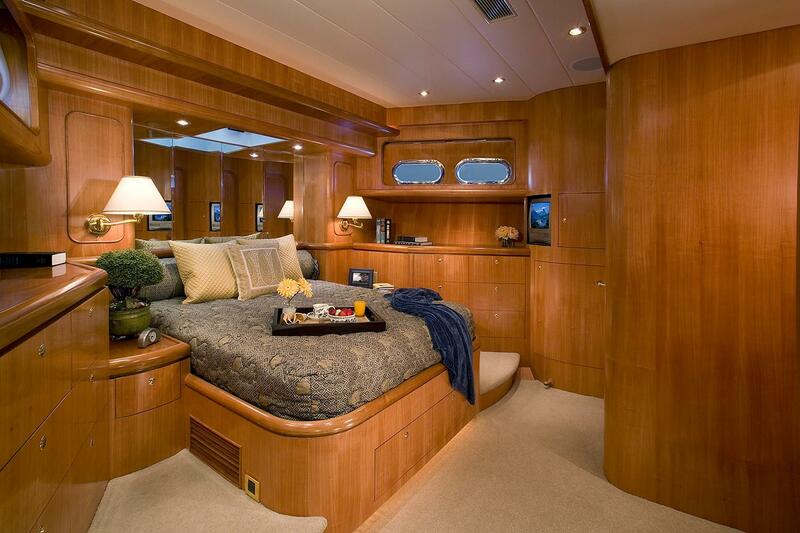 Aft Captains/Guest stateroom: This stateroom features an island queen bed with nightstands, mirrored headboard, abundant drawer and storage cabinets and entertainment center. Lighting; Ceiling, reading, indirect and bed pedestal lights. 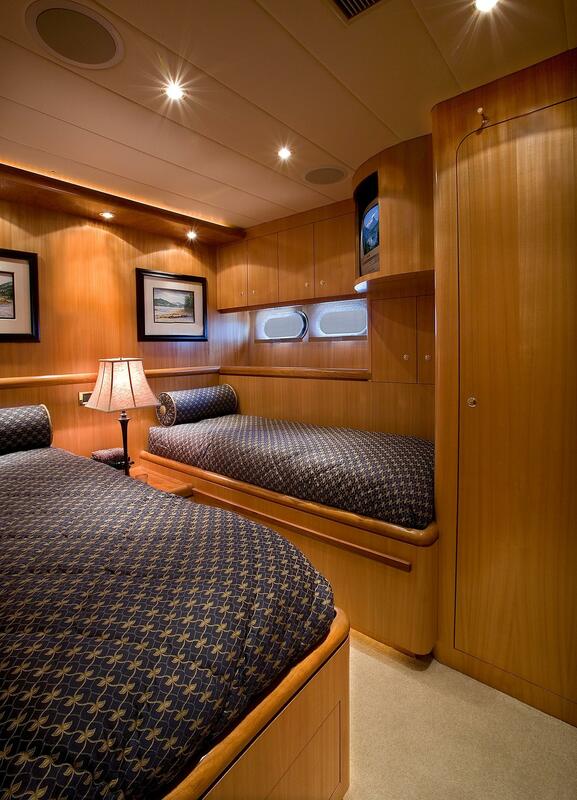 Crew/Guest stateroom: This stateroom features a double and single bed, a cedar lined hanging locker, bureau with 5 drawers and TV entertainment center. Aft head: This head is large & bright. The head is finished in white cabinetry and walls. 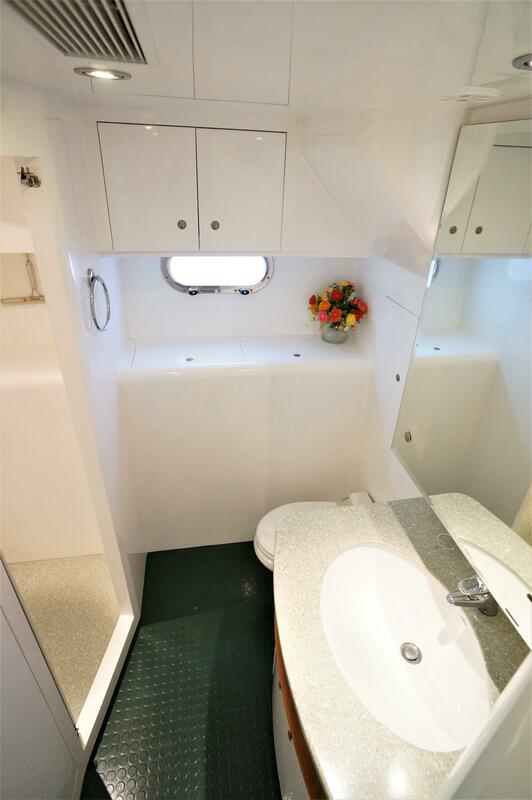 Features include a Dometic Vacuflush toilet, vanity with Corain countertop and under-counter sink, cabinet storage, S/S portlight and a large stall shower. 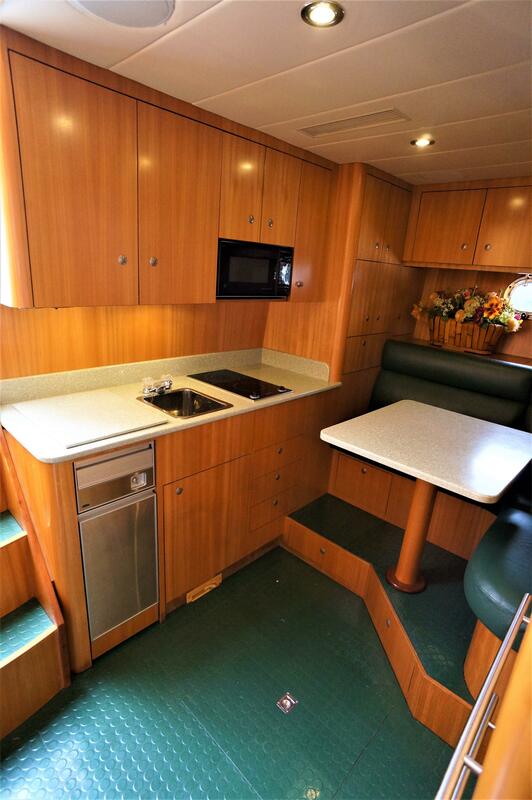 Crew/Aft galley: The galley is well appointed, if offers a SubZero 700TC refrigerator with 2 freezers drawers and icemaker, Broan trash compactor, GE microwave oven, Miele 2 burner range, Large pantry with pull-out shelves (prepped for a stacked washer & dryer), Corian countertops and abundant storage. 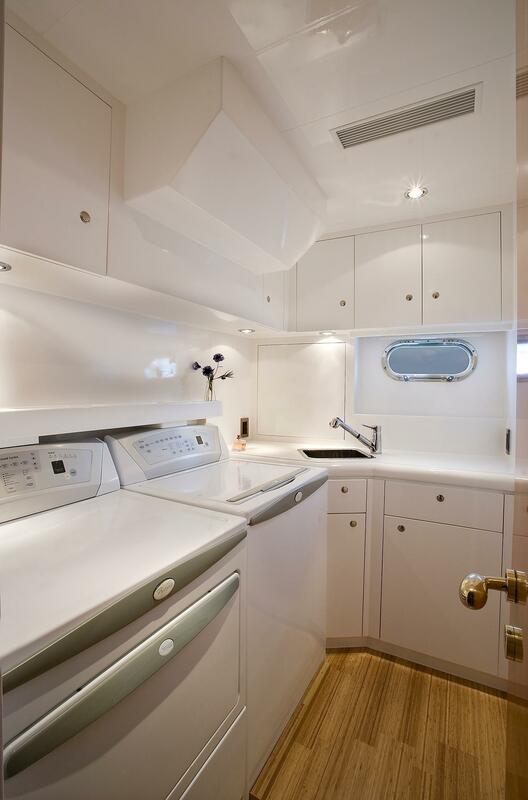 The galley is spacious, offers quality appliances, abundant food preparation & storage space as well as being smartly designed to allow it to be separated from the salon and dining areas when hosting formal dinner events. 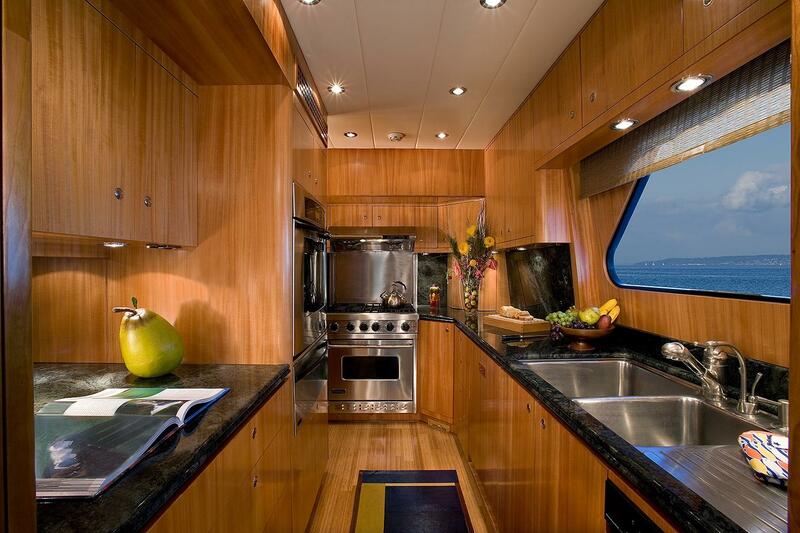 Bamboo floors, large viewing window, double stainless steel sinks, Granite countertops, large dual sliding stainless steel pantry racks are just a few of the amenities that make this a Chef's delight galley. 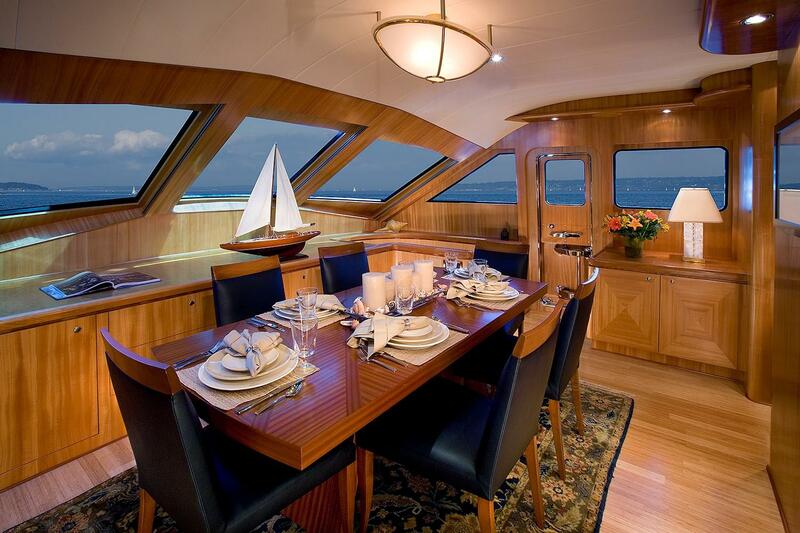 Formal dining area: The dining area is located on the main deck under the forward windshield which provides exceptional natural light, for privacy or reduced light, there are electric actuated blinds. 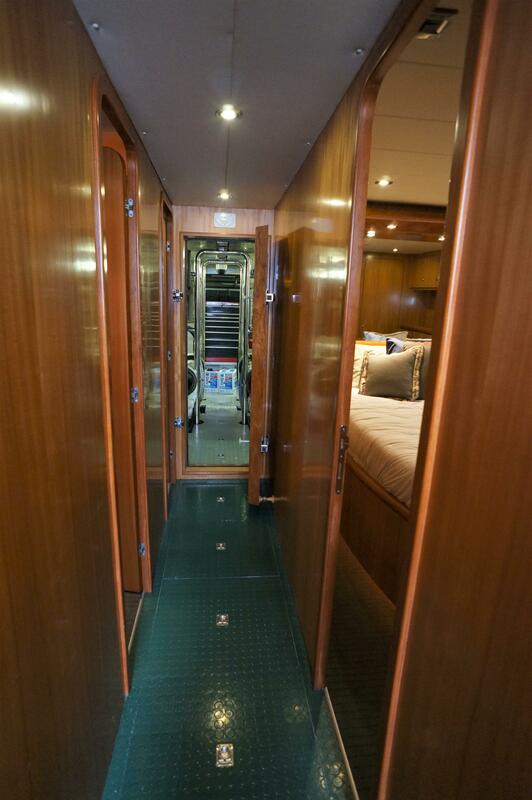 The space also features port & starboard doors that offer easy access to fore deck. The dining room offers a handcrafted cherry wood table with 6X Dakota-Jackson of New York chairs, a custom ceiling table light and a large side table. Side table with 4X drawers and bulk storage. 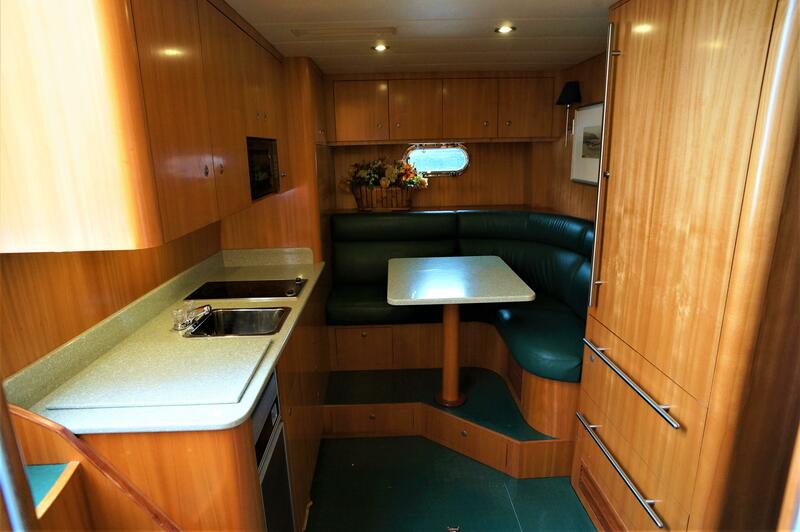 The bar is located on the starboard side of the galley and features a Kitchen-Aid icemaker, Marvel refrigerator, beverage & wine storage, granite countertop and a overhead storage cabinet for glasses and stemware. The small appliance cabinet is located across from the galley, under the skylounge access stairs. 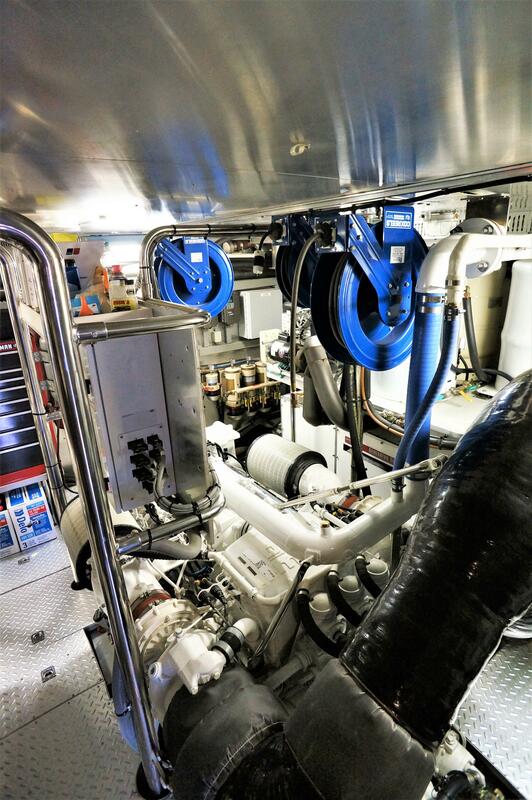 The compartment houses the handheld vacuum, accessories for the central vacuum system and offers exceptional bulk storage for the galley. The Skylounge is open, bright space that houses the main helm station, and serves as the secondary salon. 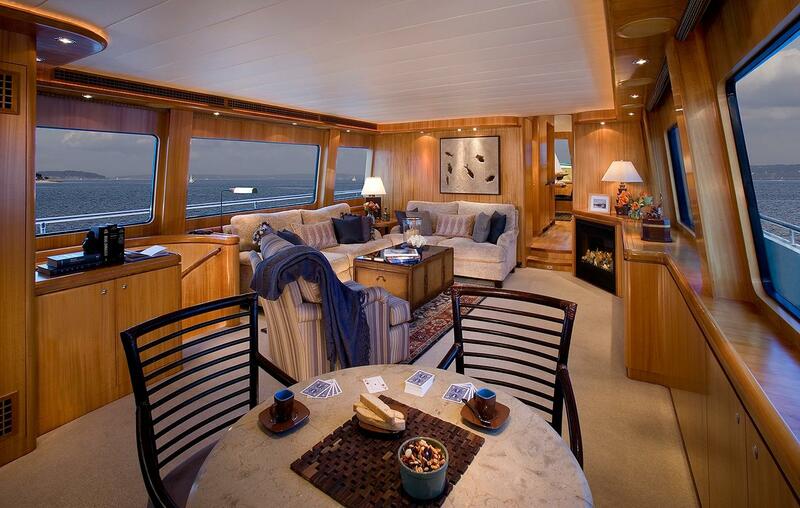 Features include large windows, bamboo flooring, 2X STIDD helm seats, a forward facing cruising settee, convertible sleeper sofa, swivel chair, entertainment center and desk, opening windows and stainless steel framed glass doors leading to the bridge deck. 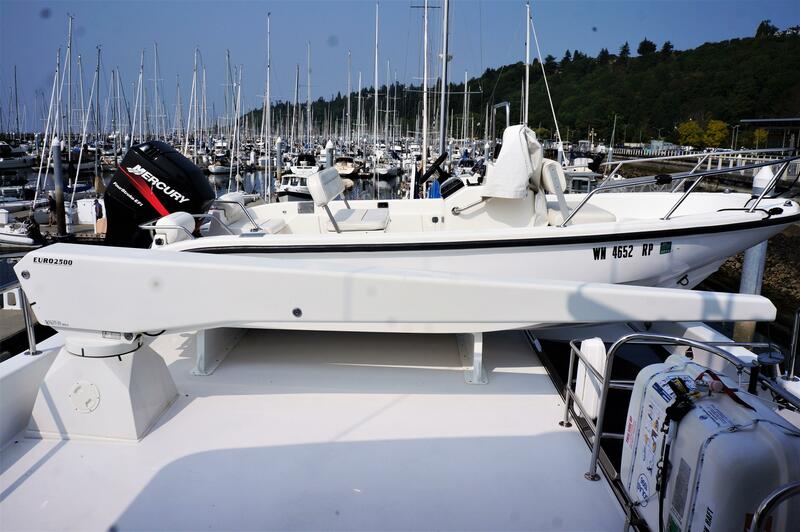 Bridge deck: Bridge deck features include a Lynx propane BBQ, Boston Whaler tender, Nautical Structures 2500lb davit and the Elliott 8 person life raft as well as offering space for lounge seating. 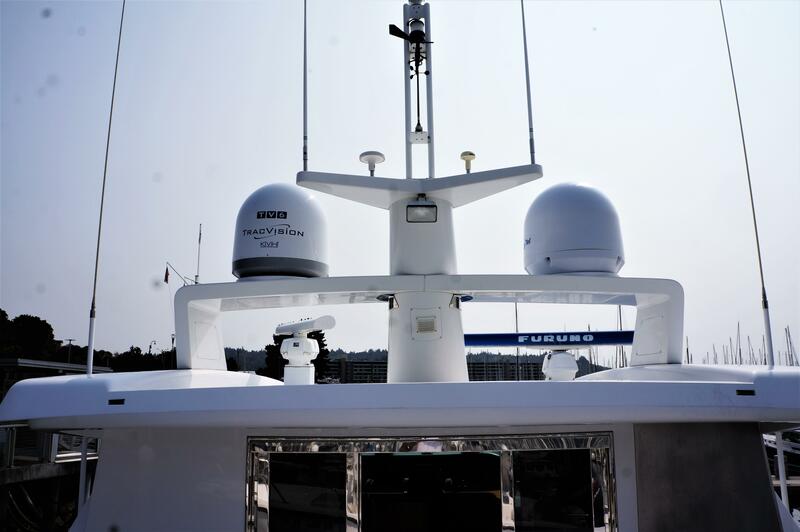 The Skylounge helm station and seating is designed to provide the captain and navigator both great visibility and easy access to the yachts navigational and safety equipment. There is seating for 6 is via two STIDD helm seats and a forward facing settee, all of which are wrapped in blue ultra-leather. 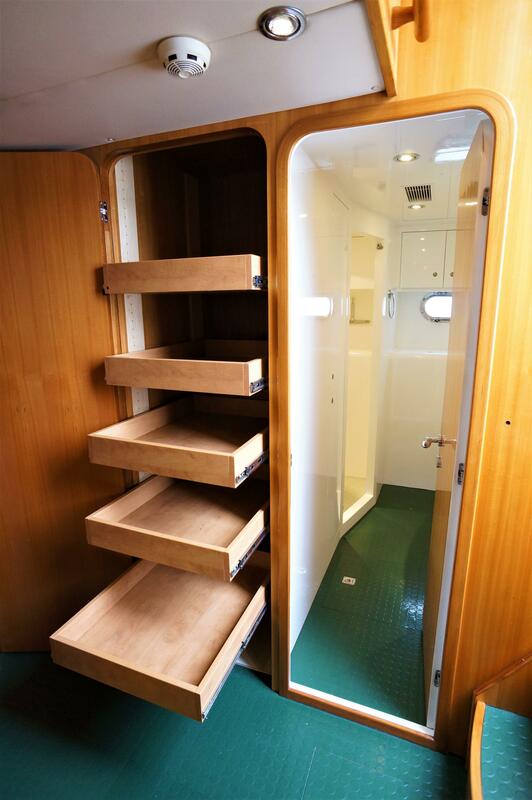 Athwart-ships fore deck storage locker with access from the port & starboard side-decks. The California deck offers seating for approximately 10 people, with a Cherry wood table, large settee and 4 teak chairs. Access is from the main salon or two stainless steel gates leading up from the cockpit. 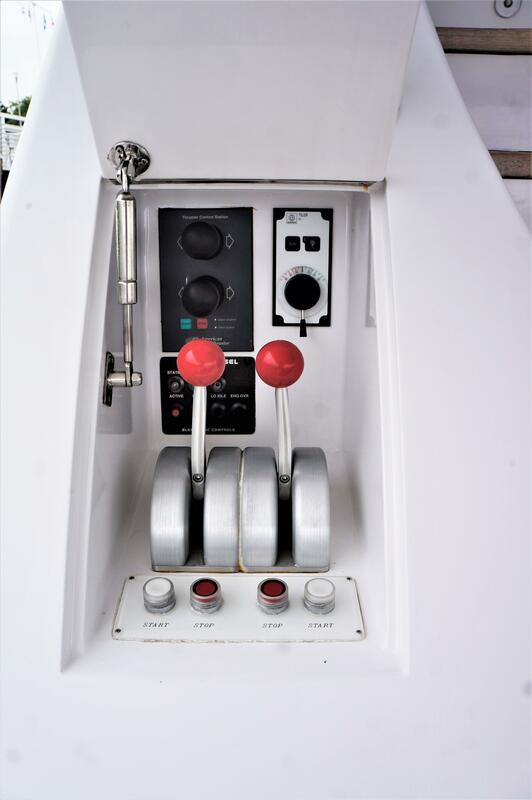 The California deck also has a port side helm control station, dual Maxwell 2000 warping winches, cameras and stairs leading up to the bridge deck. 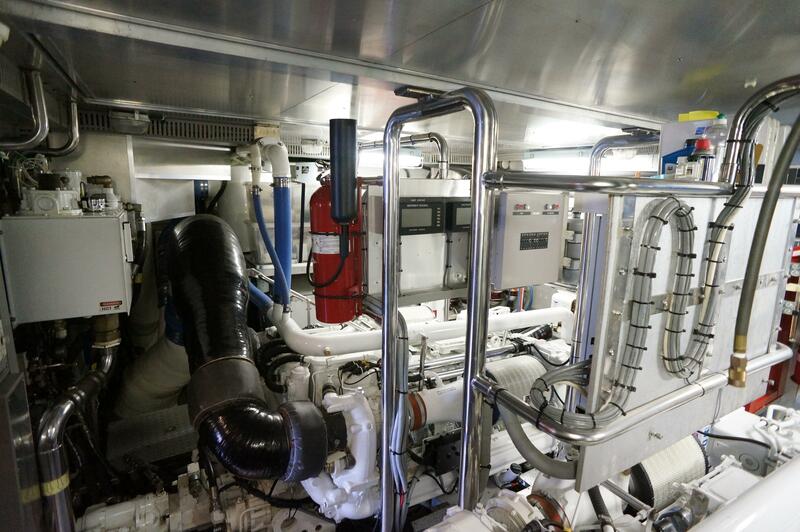 The yachts electrical system consist of 12/24VDC and 125/240VAC, with power provided via dual 240A/50V Glendinning cablemaster systems, 20KW & 32KW Northern Lights generators and 2X Magnasine 4KW inverters. 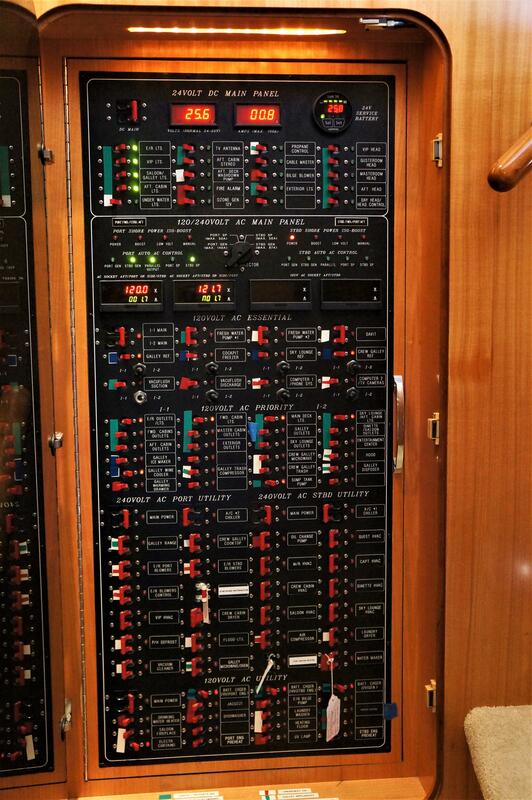 The AC & DC power is managed through the yachts power distribution panels. 2X Glendinning 240V/50A Cablemaster systems. 1X ASMITH 30 gallon 120V hotwater tank with a Grunfos circulation pump. 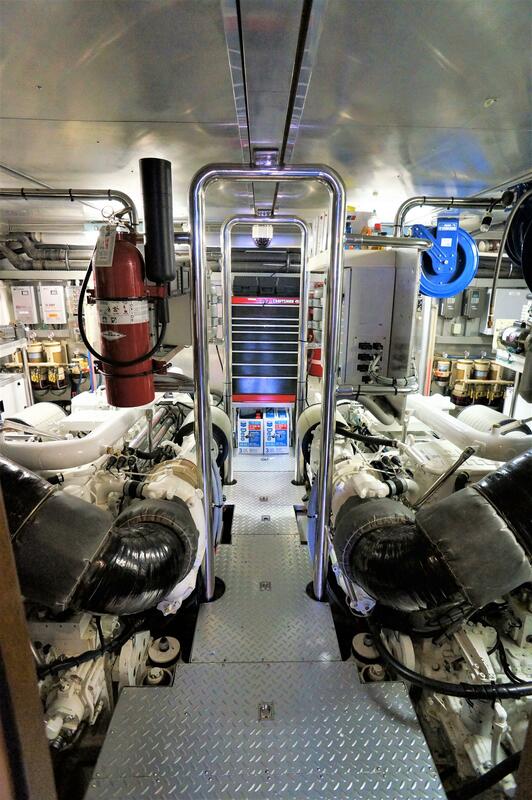 Power is provided through a pair of Detroit/MTU 1500HP diesel engines with approximately1580 hours, coupled to Detroit Allison mdl DD6449A 244:1 ratio transmissions. 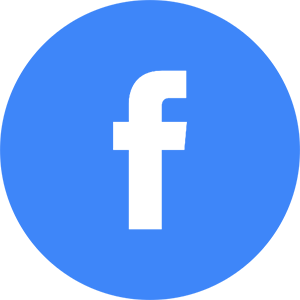 Aqua-Air 144BTU Chilled water air-conditioning/heating system. Getting aboard Mary's Promise IV and loading gear is easy thanks to the cockpits large transom door. 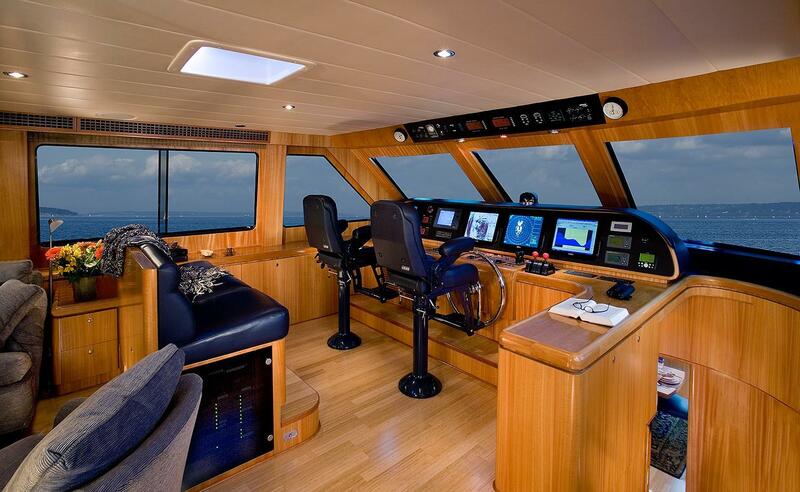 The cockpit measures 17'W x 83"D (inside measurements), offers two large storage cabinets and several cabinets built into the cockpit combing, access to the crew cabins via a watertight transom door and also the California deck & salon via the port & starboard stairs. 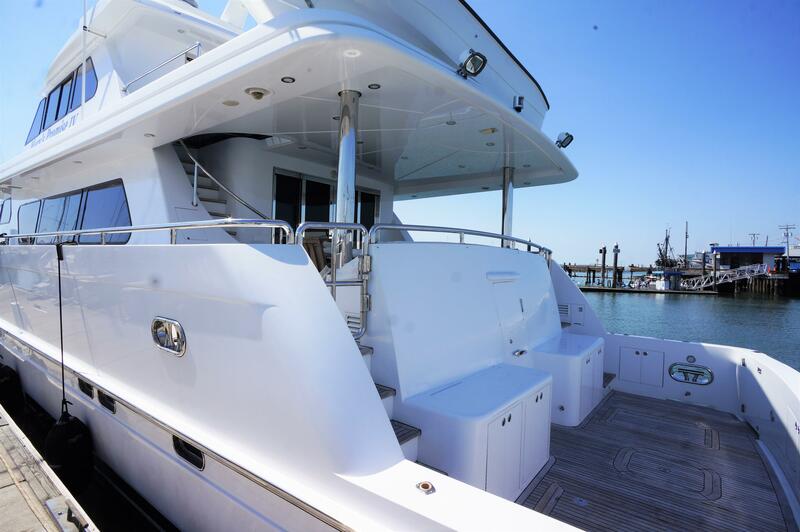 Note: there are deck and stairway safety courtesy lights throughout this yacht.